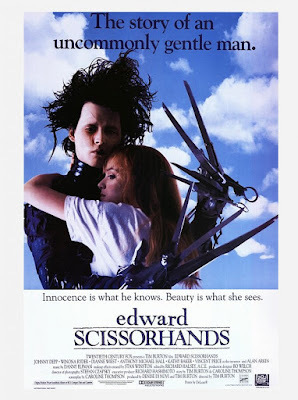 Tim Burton's Edward Scissorhands (1990) (see fig 1) is a gothic heroes tale of love and loss. The titular main character is Edward (Johnny Depp), a man who was constructed by an inventor (Vincent Price) but was never finished due to the inventors untimely death. Edward is found by a woman who brings him back home to a conventional suburban housing estate, at first everyone loves him but actively uses him, some for financial reasons and others for pleasure. It takes a turn for the worse when the town betrays his trust and runs him out of town, one boy even attempts to murder Edward. 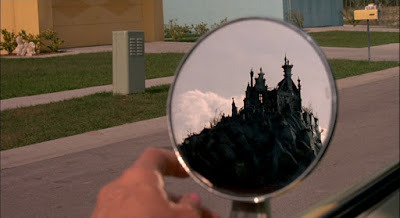 Bo Welch was the production designer for the film, he used creative visuals to show the extremes of both worlds, the colourful suburban housing estate and the gothic castle atop a dark forested hill. “One of the biggest challenges I had was marrying the film’s two distinct visual aesthetics,” Welch said. “It took some time to wrap my head around that.” (Bo Welch 2015) Welch explains that designing the movie was not an easy task. A great example of this contrast is towards the beginning of the film when Peg Boggs adjusts her car mirror and sees the castle (see fig 2) this shows just how juxtaposed the setting is, considering a "modern" american housing estate is accompanied by an ancient european castle. Welch found a newly built development of homes in Tampa, Florida and knew that was the location they needed, a new slate they could do anything with. The inhabitants were relocated to hotels during production. “This neighborhood in Florida also had a particular graphic quality, and interesting skies with its clouds.” (Bo Welch 2015) Welch states his interest at the time with the location and how he felt it had that particular look that would suit the movie well. In 2015 a photographer named Andrew Creameans traveled to Tampa and took photographs(see fig 3) that matched the stills in the movie to show how the location looks now. The film's aesthetics are designed to be what Edward see's the world as, the town is the same as any other in reality but to Edward it's a mystical land of fantasy, something he could only see from his window far away in his home, the shapes, the people, the cars and even the colours are designed to be what Edward sees, as the tagline states: "Innocence is what he knows, Beauty is what he see's" (Edward Scissorhands poster 1990) or as Welch puts it: "We designed the neighborhood to appear as though you’re seeing it through Edward’s eyes, the great thrill is the friction between those two aesthetics within a single frame." (Bo Welch 2015) As Welch explains, the point of the set design wasn't just to look nice for the audience, it also acted as a catalyst allowing the audience into the mind of Edward. Beauty truly is what he saw. Nearly there with the referencing! After the quote, you just need the surname and the date, not the full name, so (Welch, 2015) for example. Thanks Jackie! So happy i'm getting better at this, i'll be sure to take on board what you've said. Yes - this is much more specified and focused in terms of the ground it's covering and you work closely with Welch's own ideas in terms of the production design for this film. That said, you only work with Welch in this instance, which is actually a weakness in terms of evidence-based writing; it's good practice to have a 'mixed gene pool' of contributors. You could have reached out to some formal reviews of the film by which to support the success or otherwise of Welch's designs as experienced by different people. Although you've got 3 quotes, they're all actually from the same source, which essentially counts as one. Your next leap of development comes in the form of drawing on a wider variety of sources by which to scaffold and support more credibly your specific and focused observations. Ah I see, I assumed because Welch was the production designer that his word was effectively law in this matter, "who knew more about the design behind the film more than the Production designer himself?" I thought.